Although YouTube has a powerful recommendation engine, it might display videos that are not related to the one currently playing. Hence, a kid might play another video while watching something educational. Most interactive educational apps on the Play Store and iTunes have ads or in-app purchases. Khan Academy, a nonprofit organization has launched a new educational app called “Khan Academy Kids” on the Play Store and iTunes. The new app is targeted towards toddlers aged between 2 to 5 years old. It teaches kids numbers, alphabets, etc with cute animations and videos. The size of the Khan Academy Kids application is 65 megabytes. The app runs in landscape mode by default. You can’t use it in the portrait mode. Once you install and open KA, you’ll be prompted to enter an email address. Enter the email ID and tap the submit button. KAK will now send a verification link to your inbox. You must verify your email address to use this KAK. Once your address is verified, the app will ask you to select the age of your kid and an avatar image. It will also request you to enter his/her name. Once you enter a name and select an avatar, hand over the phone to your kid. The app has two sections – kids and parents. In the parent’s section, you’ll find an option to add a new account, change the kid’s name, age, avatar and delete an existing account. It also displays details about the Khan Academy organization. 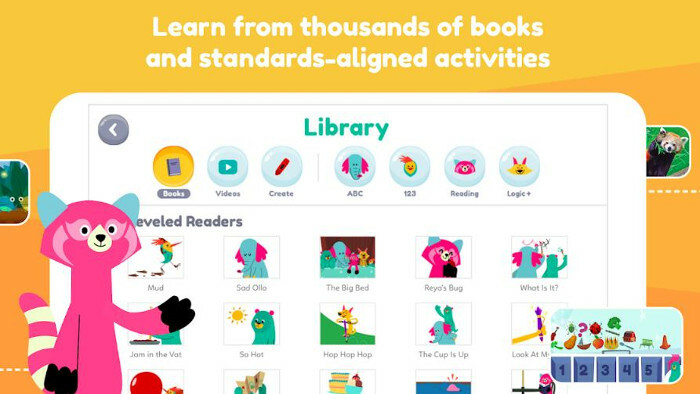 The Kids section of the Khan Academy application gives toddlers access to informative stories, videos, and books that will teach them alphabets, words, counting, addition, subtraction, multiplication of numbers, etc. It also features puzzles that will build their logic skills. The educational content and animations are provided by National Geographic, BellWether, and Super Simple Songs. KAK provides a white canvas utility on which kids can draw different objects, shapes, insert characters, etc. Apart from the white canvas, KA offers over 10+ colorful canvases that toddlers can modify. The home interface of the KA kids application displays the lessons your toddler has taken. It also enables you to disable/enable the background music. Although KA is a great application, it doesn’t have an option to quit the app. If your handset has a dedicated back button, press it twice to close KAK. If your phone doesn’t have it, swipe your finger up on right side of the screen (starting from the edge) and tap the back button twice. What does Khan Academy teach? Recognizing objects, shapes, colors alphabets. Writing and reading numbers, letters. Rhymes, the pronunciation of letters, words, etc. Conclusion: KA Kids is the best free educational application for toddlers. It provides free access to over 100 interactive lessons. It doesn’t have in-app purchases and advertisements. Khan Academy Kids is an application that will make your toddler fall in love with math, words, and stories. It is a great alternative to YouTube and other educational apps.